The majority of youth in the African continent are moving away from rural to urban areas seeking jobs, even in the informal service sector. Yet, empirical evidence shows that over 60% of African employment is in agriculture where the potential for enhanced productivity and value chain development is high. As a consequence, emerging opportunities for youth in agriculture and agribusiness remain largely unexploited. Victor Manyong speaking during a panel discussion with the keynote speakers. This was noted by the Permanent Secretary of Industrialization in the State Department for Investment and Industry, Ministry of Industry, Trade and Cooperatives, Ms Betty Maina, while giving a keynote speech on the role of youth in agriculture in realizing Kenya’s Vision 2030. 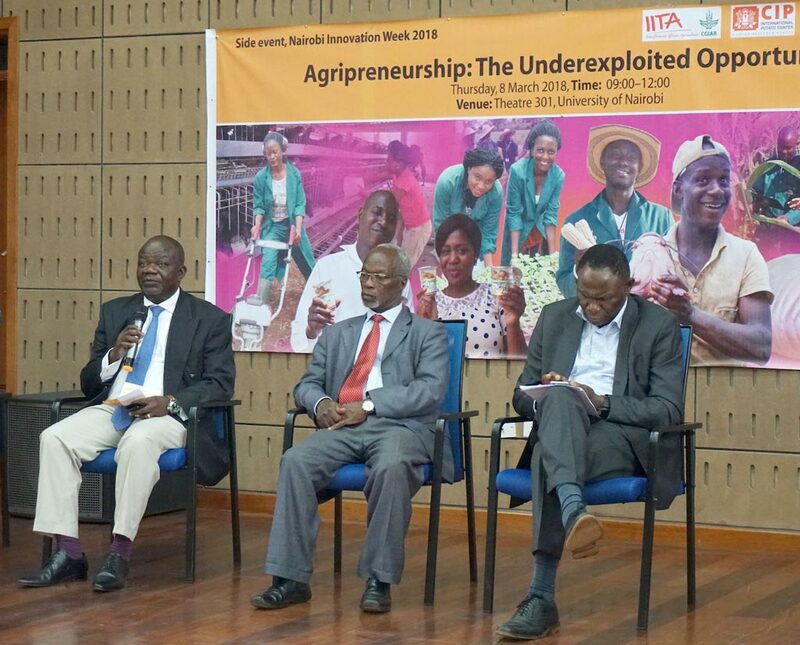 She was speaking at a forum looking at the unexploited opportunities for youth in agribusinesses organized by IITA and the International Potato Center as part of this year’s Nairobi Innovation Week. The aim of the event was to bring together youth interested or engaged in agriculture, and institutions and organizations supporting them to discuss challenges and opportunities of youth engagement in agribusiness. In her speech read on her behalf by the Ministry’s Director of Policy and Research, Ambassador Joseph Kiplagat, Ms Maina further noted that the average age of African farmers is 60. “This has negative implications not only for food security in the country but also for the sector and the country’s economic growth. Attracting youth to agriculture will therefore save both the country and the sector,” she said. “However, to unlock opportunities for youth in agribusiness, the agriculture sector needs to be modernized through investment in its transformation towards agribusiness. It must transform also from subsistence to being innovative, commercially oriented, and modern,” she added. This was reiterated by IITA’s Director for Eastern Africa, Victor Manyong, who noted that the youth with their energy, knowledge, and risk-taking were in a better position to transform the agriculture sector. “For agriculture to address the challenge of meeting the demand for food for a rapidly increasing population in Africa, we need to use new modern technologies and techniques. It is easier for young people to adopt new farming methods than older farmers,” he said while giving welcome and introductory remarks at the forum. He said this was one of the reasons that IITA had started the Youth Agripreneurs program–to attract young graduates to agriculture. The youth are also conduits for disseminating new technologies and knowledge from research to the farm. “Agriculture is seen as a sector for the uneducated. The IITA youth program is active in nearly all the countries we are working in and through an incubation program the youth are exposed to new farming methods and processing of staple crops to support value chain development,” Manyong said. The well-attended forum was a mixture of presentations from experts and panel discussions. Giving a talk on the opportunities for youth in agriculture. Prof Bitange Ndemo of the University of Nairobi said the sector presented immense opportunities for the youth to tap into and develop innovative solutions. “Innovation is finding a solution to a problem. Fortunately, or unfortunately, there are many problems in the agriculture sector in Africa to innovate around,” he said. While acknowledging the many obstacles the youth faced in engaging in agriculture and agribusiness, Ndemo also challenged them to turn these into opportunities and think out of the box to find innovative solutions. Two panel discussions were held at the forum. One brought together youth engaged in agriculture to share their success stories and the other brought together research organizations supporting youth to engage in agriculture. 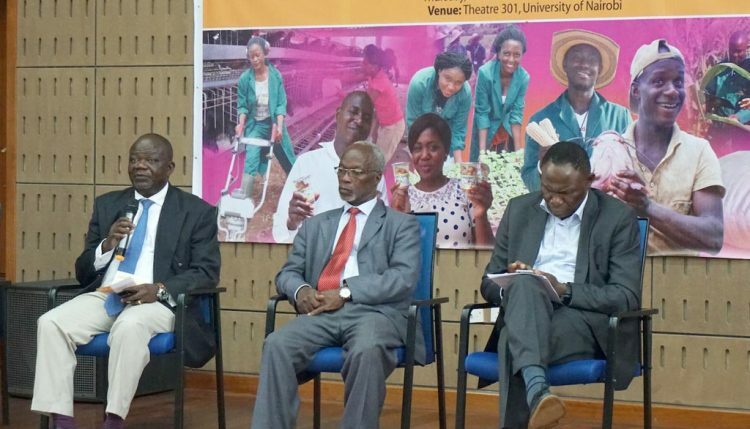 The youth panelists were drawn from the IITA Youth Agripreneurs in Kenya based at Kibwezi, from another group supported by CIP in processing orange-fleshed sweet potato, and from an incubation platform by the United States International University (USIU). They shared their journey into agribusiness and their successes. “I joined the IITA Youth Agripreneurs in Kibwezi when I was unable to get a job after graduating from university. And I do not regret it. We are now making enough money to meet all our needs and extra to plow back into our businesses. We are engaged in vegetable and fish farming. We are not even able to meet market demands. So, there is a lot of future opportunities for growth. I therefore advise the youth: come to agriculture and employ yourselves,” said Tabitha Mule. The enablers’ panel discussions brought together representatives from the Kenya Youth Enterprise Development Fund, African Agricultural Technology Foundation (AATF), and CIP. Ms Millicent Maina, Regional Coordinator, Nairobi Region, noted that while the Development Fund provided affordable loans to youth, many still shied away from taking loans. Elly Atieno, a research associate with CIP, briefed youth on opportunities for their participation along value chains of staple crops using sweet potato and Irish potato as examples. He noted that many of the farmers missed lucrative markets as they failed to meet market standards. He gave an example of the well-known American fast food chain KFC, which was not able to source potato locally for their fries. George Marechera, Business Development Manager for AATF, focused on mechanization in agriculture. He noted that many youth were repelled by the drudgery in agriculture and therefore the development and promotion of simple, affordable machines was a crucial area in efforts to involve youth in agriculture. The well-attended forum was very interactive and was facilitated by Koki Robi from USIU and David Ngome from IITA Central Africa hub.